Refrigerated trailers aren't too much different than hauling a dry van these days. But there are a few specifics to be aware of. Modern units (reefer unit) are very well built and reliable. They automate the temperature much as a refrigerator or furnace would in your home. You simply set the temperature and it takes care of the rest. Often times reefers are used to protect a product from freezing and thus are capable of heating or cooling the trailer. The reefer unit will have some indicator on it, usually a series of lights, which can easily be seen through your mirror as you are driving to indicate whether the unit is functioning properly. Generally a green, yellow, or red light will let you know how the unit is functioning. It takes very little additional effort to simply maintain a certain temperature in the trailer. All you do is set the temperature on the unit with the keypad and keep fuel in the unit's fuel tank. Once in a while you will have a problem with one of the units and will have to take the trailer to a reefer repair shop to have it looked at. Your company will advise you on this. Reefer companies haul a lot of food as you would expect. 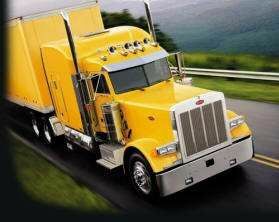 They also haul a variety of products which may or may not require temperature control, like some hazardous materials. However you will often find yourself hauling the same products you would be hauling in a regular dry van. You aren't limited to temperature-sensitive products but they do tend to pay more to the company hauling them so they try to get a temperature-sensitive load if they can find one. The main difference between hauling a reefer and hauling other types of trailers involves the type of driving you do. The main difference between hauling a reefer and hauling other types of trailers involves the type of driving you do. Produce loads are the bread and butter of the reefer industry. “The Valley” in California is one of the richest produce areas in the world. Tons and tons of produce comes out of California everyday heading all over the country. Because of this, a lot of reefer companies try to get you out to California as often as possible and the average run tends to be much longer than those in other forms of trucking. However it is quite common to have to make several small pickups in different parts of California and hauling them across the country to their destination. Anywhere from 3-8 pickups is quite common. This can be very time consuming and tiring. You will likely get paid maybe $10-$20 per extra pickup, but when you consider it takes you an entire day rather than a couple hours to pick up a load you usually would rather just make one pickup and get rolling. The other problem comes at the delivery. Most of these loads go to some sort of grocery warehouse or farmer's market. Getting the trailer unloaded requires your company to pay somebody to do it. I never could understand why grocery deliveries were the driver's responsibility to get unloaded. Almost no other type of freight will work this way. You have to hire a “lumper”, which is generally a group of guys that have their own independent company hired by the warehouse or market. If you've never had to deal with grocery warehouses, this may not sound like any big deal, but BELIEVE ME, it is the most thoroughly aggravating thing you will deal with in the reefer industry. The trucking company will actually pay the money, not the driver, but the driver has to handle the transaction. These grocery warehouses also don't seem to mind making you wait 6-12 hours on the average before they will even begin to unload you...another day wasted. If you've never had to deal with grocery warehouses, this may not sound like any big deal, but BELIEVE ME, it is the most thoroughly aggravating thing you will deal with in the reefer industry. Many, many drivers have switched from reefer to dry van jobs because they just couldn't stand one more day sitting in the parking lot of a grocery warehouse waiting to be unloaded. It wears you out after a while. The pay difference between reefer and dry van is minimal. You generally will pick one or the other because of personal preference, not pay. Some people like the longer runs and traveling coast to coast with the reefer companies, while some prefer the shorter runs and greater home time you can generally find with a dry van. Not having to deal with grocery warehouses is also a bonus for dry van drivers.